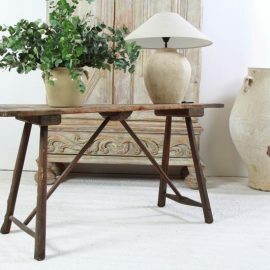 Search Results for “console” | Page 3 | Interior Boutiques – Antiques for sale and mid century modern furniture, french furniture, antique lighting, retro furniture and danish furniture. Condition Report : Very good – original plate to mirror. One repair to marble top.. Console and Mirror by Pier-Luigi Colli. 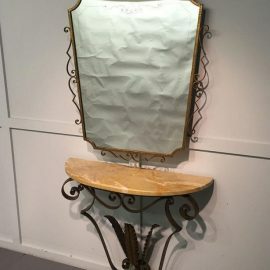 Mirror with etched decoration to the plate. 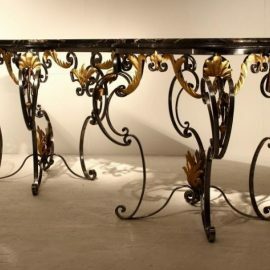 Nice quality ironwork. Condition Report : Original condition with fabulous patina. Condition Report : Slightly uneven top due to wear and age. 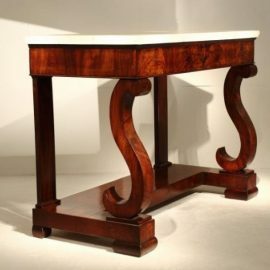 Petite 19th Century French mahogany console table with marble top. 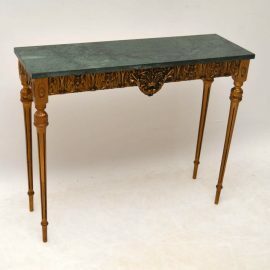 Stylish, French 1950's large polished and gilded metal console with impressive marble top. 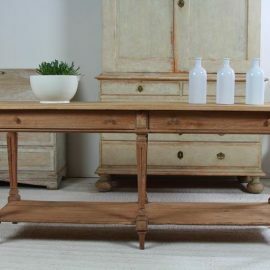 The proportions of this console table are what everyone always asks me for. It’s small & slime from front to back. 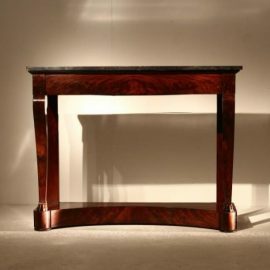 This antique gilt wood side table has a marble top which just sits on the frame. The frame has some gesso applications, some carving & fluted tapered legs. It’s in good original condition & I would date it to around the 1930’s period. 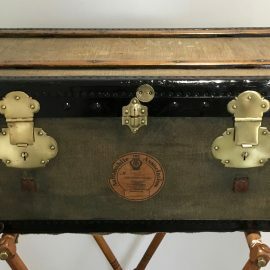 An early 20th century trunk.Wood based with celadon green canvas covering, black metal trimming, original leather side handles polished wood binding, and brass locks and corner pieces. 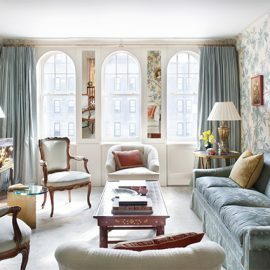 The size is smaller than usual and would be ideal as a side table or as a feature piece under a hall console. With original cloth lining and removable tray, this neat trunk provides an elegant storage solution.